If you've been thinking of picking up a nimble new roadster, but can't decide between the Mazda MX-5 Miata and its Italian counterpart the Fiat 124 Spider, the vehicle you see here might tip the balance. 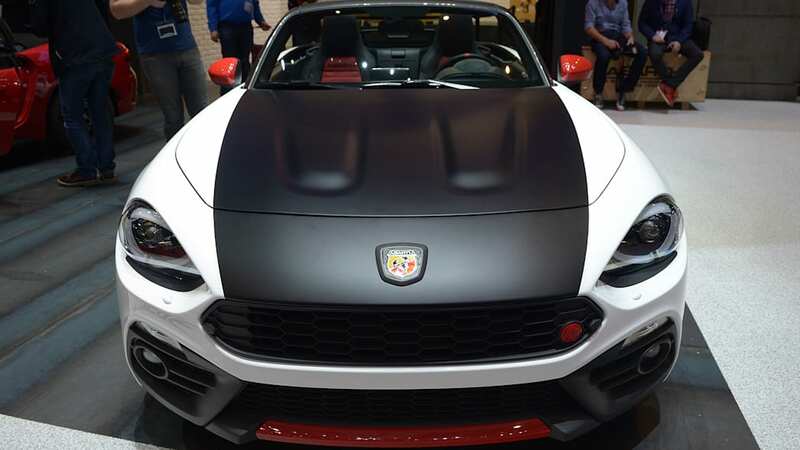 It's the new Abarth 124 Spider, tuned by the Italian automaker's performance division. And it's just made its debut here on the floor of the 2016 Geneva Motor Show. The Abarth version, of course, is based on the Fiat model, which in turn is based on the Mazda. But the one with the Scorpion emblem offers a number of performance upgrades. 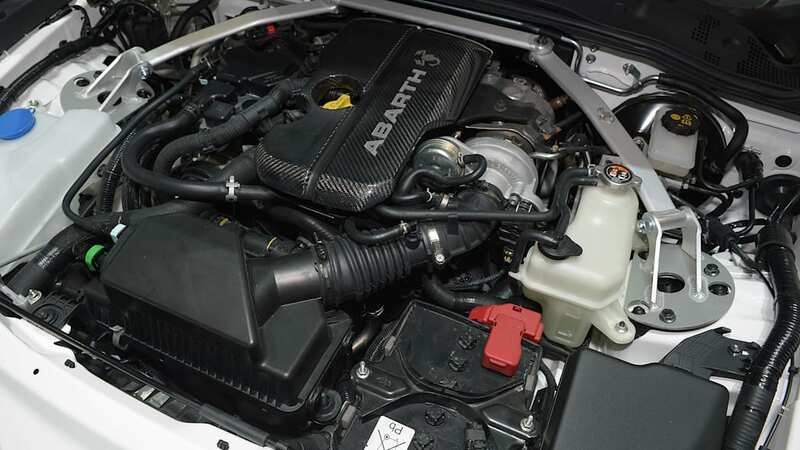 Under the hood is still a 1.4-liter turbo four, producing the same 184 pound-feet of torque, but in Abarth spec offers a more prodigious 170 horsepower (up from 160). Buyers will still be able to choose between a six-speed manual or automatic transmission, but the rest of the components are no-brainers: Brembo brakes, Bilstein dampers, and a Record Monza exhaust. The steering is electrically assisted, but it has a proper mechanical limited slip differential, there's a Sport button, and the electronic nannies can be fully defeated for hooning around on track. The sum total is a 0-62 time quoted at 6.8 seconds and a top speed at 143 miles per hour. Bear in mind that these are specs for the European model, though, and could change if and when the Abarth spider makes its way to our shores. 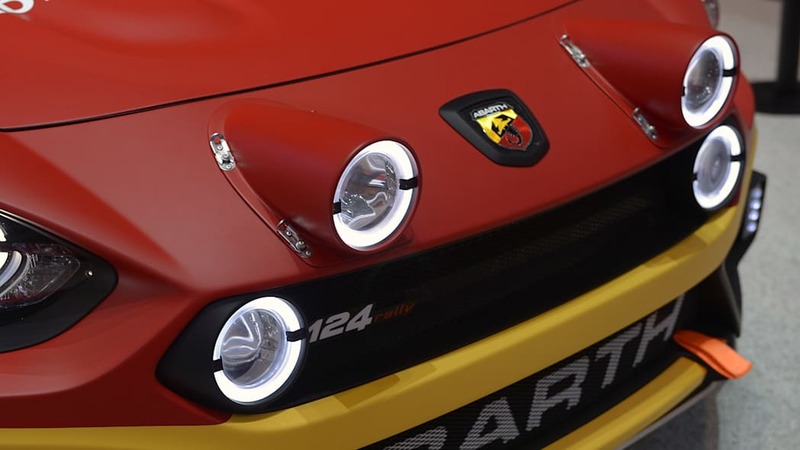 Of course the technicians at Mirafiori didn't leave it there, equipping the Abarth 124 Spider with an array of visual enhancements as well. There's a full aero kit, larger air vents, 17-inch alloys, and a black hood to cut down on glare (and make it look more businesslike). The interior is all done up in Alcantara, with a small-diameter steering wheel, short gear lever, aluminum pedals... the works. As if all that isn't enough to get your motor running, Abarth has also worked up a rally version to recall its glory days of old. 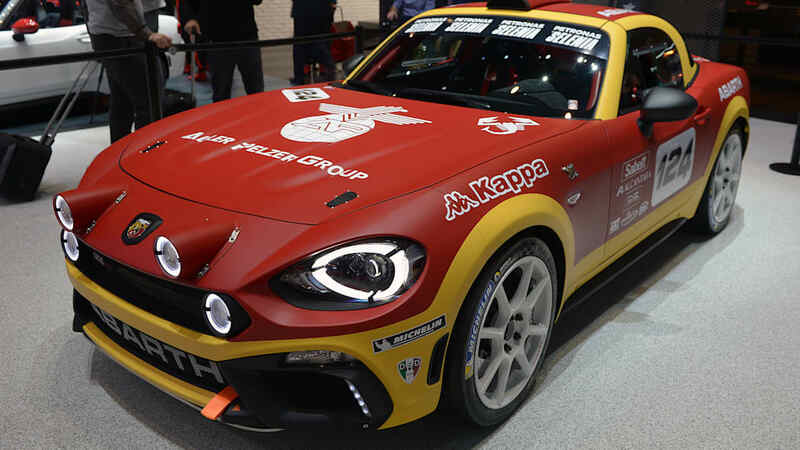 The Abarth 124 Rally is built to FIA R-GT regulations, and ditches the 1.4-liter engine for a 1.8 mounted further back and producing an impressive 300 hp. It also has a fixed roof, full roll cage, and a long list of other competition-spec upgrades that are too long to list here, but you can read all about them in the second of the two press releases below. The new Abarth 124 spider aims at sweeping a new generation off their feet with its performance and technical DNA. It combines the authentic roadster experience packed with thrills, technology, safety and a touch of unmistakable Italian design. The car will be available in September with prices starting from € 40,000 for all Europe. The new Abarth 124 spider combines the great sensorial experiences of excitement and driving fun that only a spider can give. Developed with input from the Abarth Racing Team, the car exemplifies at best the distinctive Abarth values: performance, craftsmanship and technical excellence. It is the car that will bring back the smile on the driver's face. 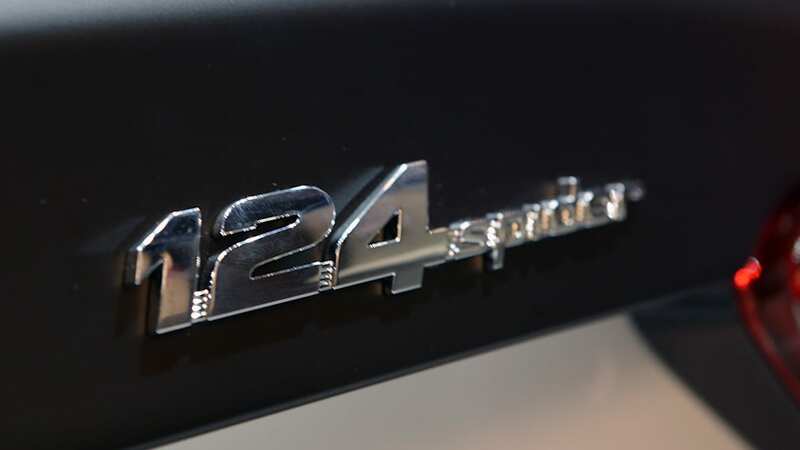 124 spider is designed for thrills and performance and has all the qualities needed to satisfy even the most difficult-to-please drivers. For exceptional dynamism, the Abarth 124 spider is equipped with a sports mechanical Limited-Slip differential as standard to secure drive and traction in the most critical situations and provide incomparable dynamic behavior. 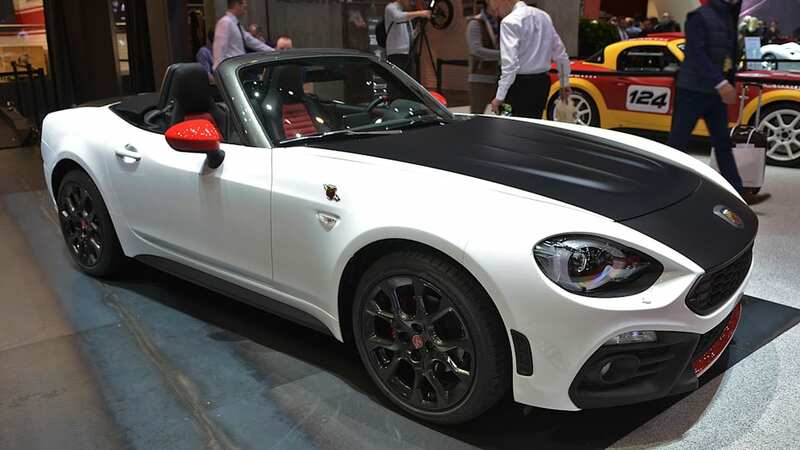 Abarth 124 spider creates a new benchmark in the sporty roadster segment and this is confirmed in numbers. Much of the weight is concentrated between the axles and the engine is installed behind the front axle to guarantee agility and superior driving feel. Sophisticated mechanicals and the use of special materials have contained the weight to just 1,060 kilograms, which results in a weight-to-power ratio of 6.2 kg/HP, the best in its category, and perfect 50/50 weight distribution in running order, which translates in great agility and performance. Taking on board the lessons learned through the Abarth racing series, the weight obsession pushed Abarth to eliminate gram by gram all possible weight: For instance, an active bonnet system was developed in order to comply with the strict passenger collision standards without damaging the weight coefficient or balance of the car. By using sensors on the cross-member and two pyrotechnic loads in the engine compartment, the system recognises danger and deploys in a few milliseconds to guarantee a safety gap and attenuate the collision against the bonnet. The suspension of the 124 spider has a high double-wishbone layout in front and a five-link set up in the rear, specifically tuned for greater braking and cornering stability. Steering ensures a great driving feeling with the use of a dual pinion electric power assist system. The Abarth dynamic vehicle set-up ensures customers can get the most out of the rear-wheel drivetrain, always aiming for the true driving pleasure. Also the "Abarth by Bilstein" dampers, together with stiffened anti-roll bars, provide ultimate handling and driving comfort. 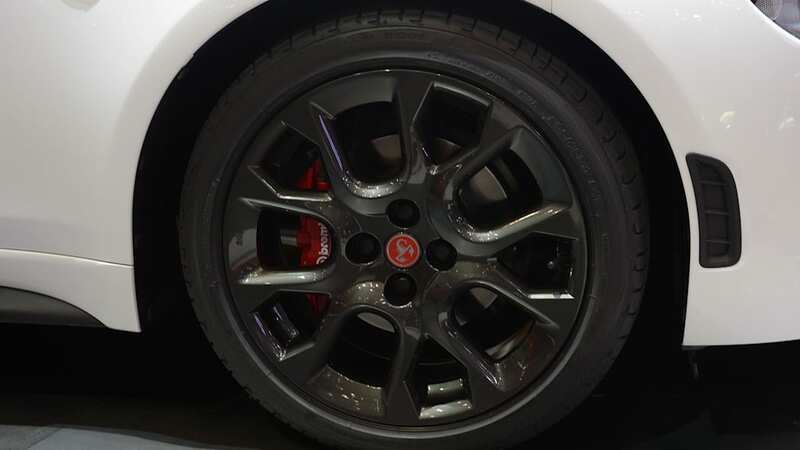 The Brembo braking system, with aluminum front callipers, guarantees very short braking distances and excellent resistance to brake fade, making the pedal always feel pleasant and safe. The Abarth 124 spider offered in the EMEA region is equipped with a powerful, reliable four-cylinder 1.4-litre MultiAir Turbo engine. It delivers 170 HP (about 124 HP per litre) and 250 Nm of torque. It has a top speed of 230 km/h and goes from 0 to 100 km/h in 6.8-seconds. 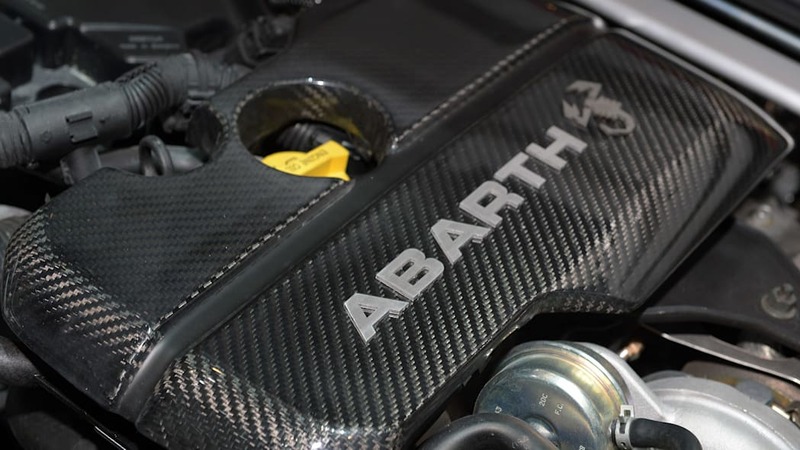 Furthermore, the sound of engine really matters in an Abarth car, so the Record Monza exhaust come equipped as standard, generating a beautiful growling sound. The spider is available with a six-speed manual or the automatic Sequenziale Sportivo gearbox. The first is characterised by quick and accurate shifting with a short-throw, direct lever. The Sequenziale Sportivo gearboxis the result of careful tuning to exploit all the engine torque and conveys genuine racing sensations. Using the lever or the paddles behind the steering wheel, shifting is extremely fast and the performance of the car is boosted even further by setting "Sport" mode on the driving mode selector. 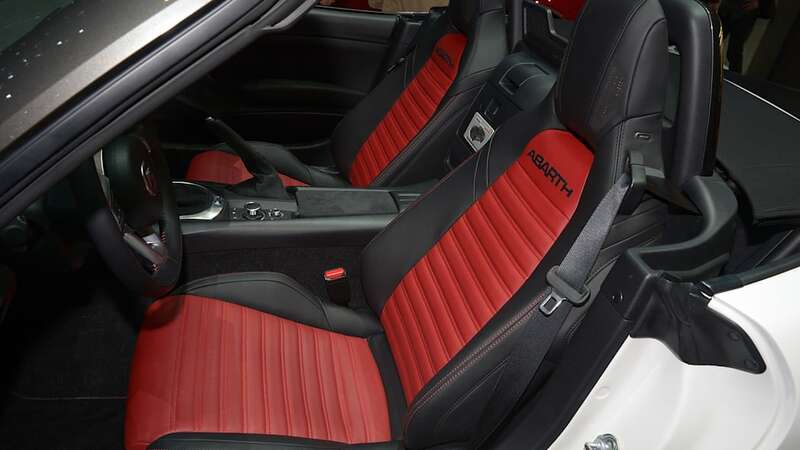 The Abarth 124 spider comes with state-of-the-art electronic devices and active safety features but to ensure the Abarth provides a proper race car feeling when driving on track, the new 124 Spider lets the driver disengage the electronic controls to experience the perfect mechanical balance and linear engine response, the trademarks of a genuine rear-wheel drive sportscar. 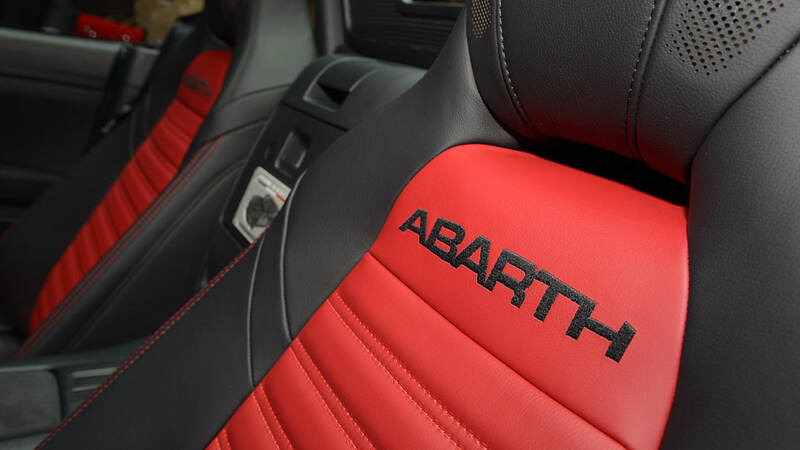 Officine Abarth, based in Mirafiori, is where the 124 spider emphasise the typical Italian art of driving. The 124 receives a special treatment from Abarth technicians, who truly love cars. The Abarth people bring their values to an already great product, by fitting the Racing Anti-glare kit, a matt black treatment for bonnet and boot lid, the Racing Alcantara® Kit that contributes to elevate the overall interior quality, ensuring at the same time a proper sporting feel due to its dark finishing and grip. 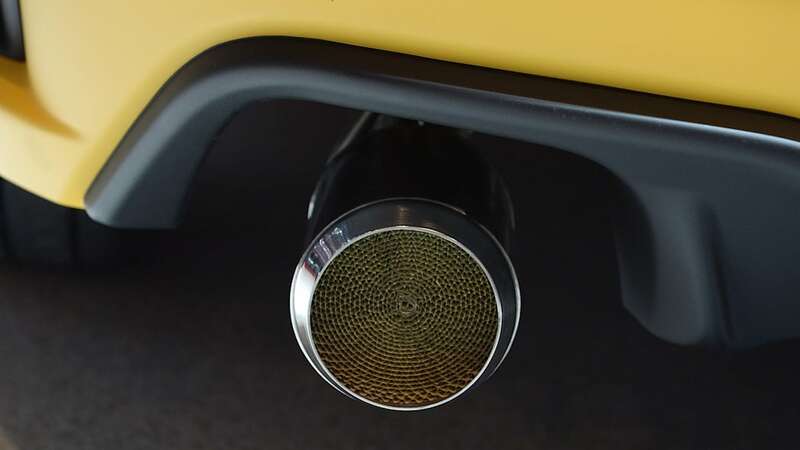 The standard-fit Record Monza exhaust is also installed in Officine Abarth, to ensure outstanding engine performance and an unmistakable sound. 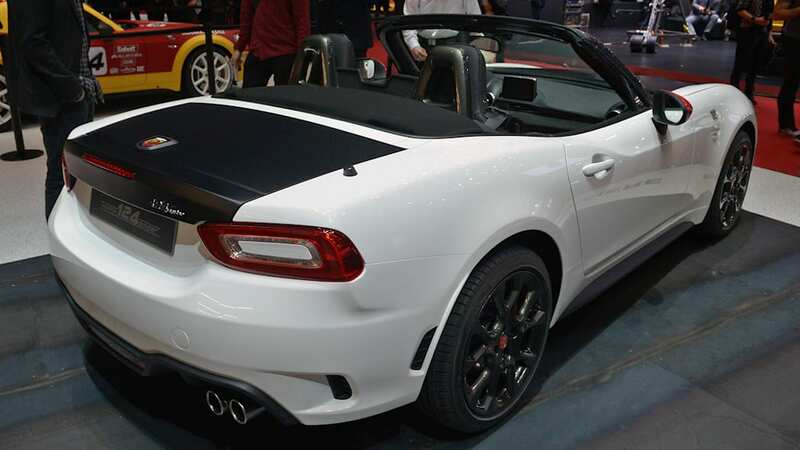 Each car is tested and certified by an Abarth technician who applies a metal plate showing the sequential number of each car to certify the exclusiveness of Abarth 124 spider. A unique number for a unique client. 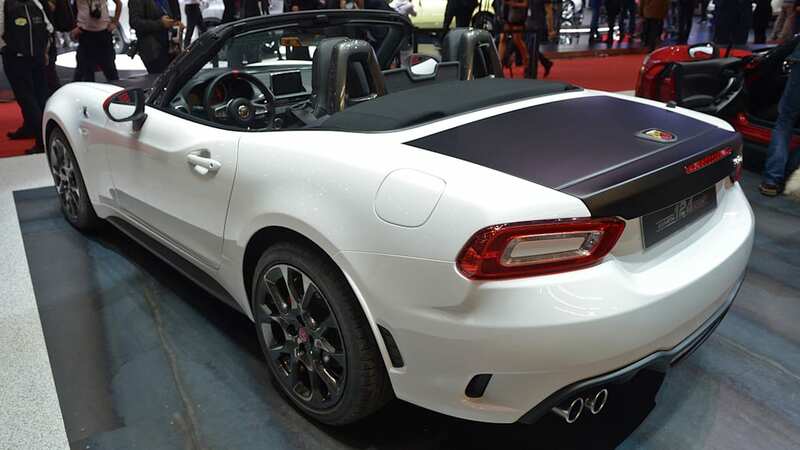 The design of the Abarth 124 spider reflects the superb mechanical layout of the car, a key element to achieve the perfect proportions for a sport car: A long bonnet to underline the importance of the engine and the powerful attitude of the car, reduced overhangs to emphasize its agile attitude, a cabin close to the rear axle to let the driver feel the road. The passenger compartment-to-bonnet ratio is comparable to that of a racing car. 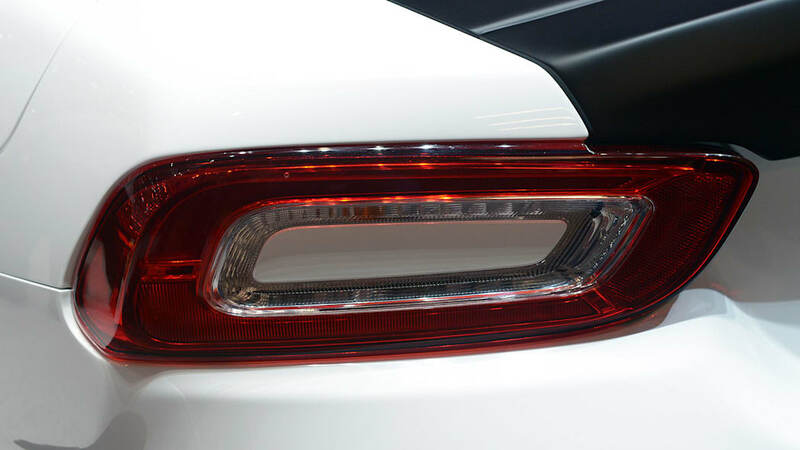 A horizontal line rises from the front and stretches rearward to join with the rear line near the rear light cluster: this is an unmistakable reference to the classic 124 spider. The design is all about performance: both the front bumper, with its larger air intake, and the rear bumper's aerodynamic extractor were both shaped in the wind tunnel, as were the rear spoiler and wind stop which both contribute to improving air flow. The 17-inch alloy wheels, the windscreen surround and the roll bars are finished in "Forgiato Grey", a colour selected to underline the bold, technical inclination of the car. 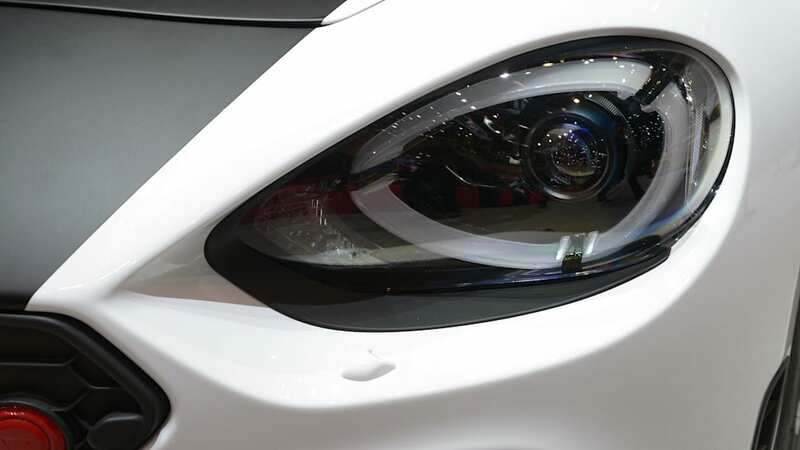 The original headlights together with the front hexagonal grille contribute to reasserting the car's bold personality. The bonnet humps suggest the longitudinal position of the engine: this is a direct reference to the original 124 spider. The exclusive LED headlights and rear lights add expressiveness to the car, both during the day and at night. An important detail are the rear light cluster inserts in matching body colour which form a luminous ring-shaped surface. 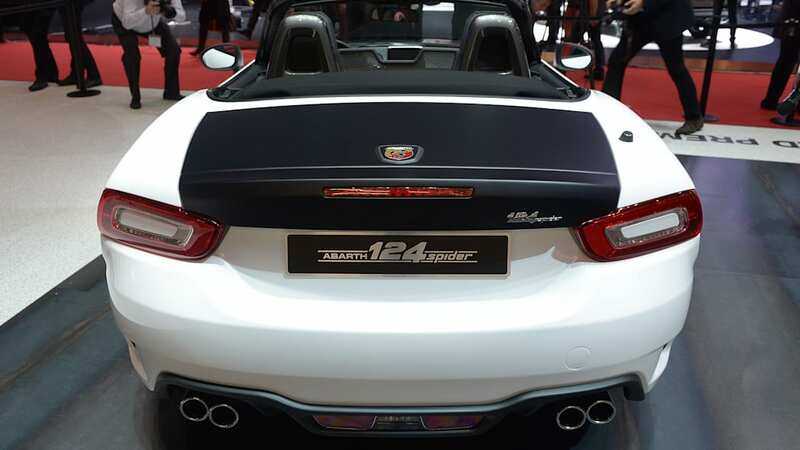 The rear end of Abarth 124 spider is characterised by two elements: the swallow-tail section rear wings and the horizontal rear lights which pick up particular features of its classic predecessor. The shape of the rear bumpers with the upper surface jutting into the boot lid conveys a characteristic V-shape to the back of the car. Five body colours are available: special solid "Turini 1975 White " and "Costa Brava 1972 Red, metallic "Isola d'Elba 1974 Blue", "Portogallo 1974 Grey" and "San Marino 1972 Black". The nomenclature is a clear tribute to its prestigious success in rallying. The Abarth DNA is also confirmed inside with an overall focus aimed at guaranteeing ideal ergonomics. The leather seats are supportive and very comfortable at the same time, and allow for a positive driving position as far back and as low as possible to better perceive any lateral movement of the car. Also, the controls are perfectly in tune with the car's sporty set-up: the position of the aluminium pedal board, the small-diameter steering wheel, the short gear lever and the start button on the dashboard all contribute to conveying a sporty driving experience. The instrument panel includes a large rev counter with red background arranged in central position. 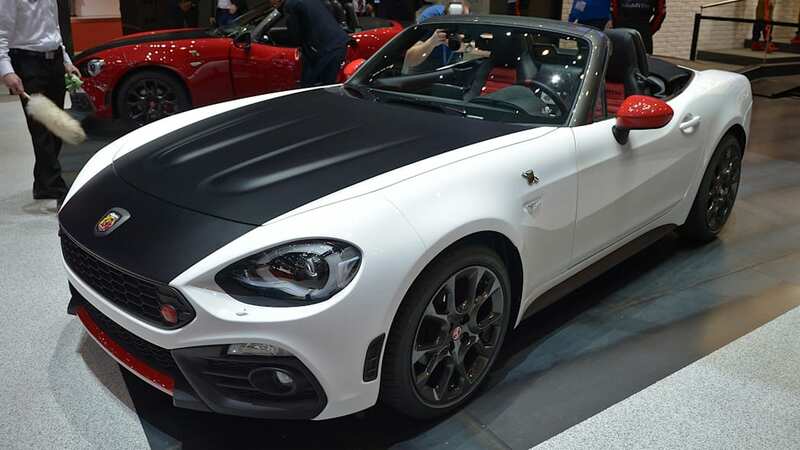 The new Abarth 124 Spider is equipped with a host of state-of-the-art active and passive safety devices. In addition to the ABS, standard equipment includes the EBD, for adjusting front and rear brake force distribution so as to optimise braking distances and control in all load conditions of the car, and ESC for increased control in all driving conditions. It is useful in critical situations, e.g. on corners and mixed surfaces in presence of snow, ice and gravel. The ESC applies selective braking and acts on the accelerator to bring the car back on line if a difference between the driver's action and trajectory is detected. The ERM is an extension of the ESC system and exploits the sensors to calculate whether the car is approaching a potentially dangerous condition at risk of rolling over. It corrects the risk by applying the brakes separately and modulating the accelerator position as needed. It can be fully disengaged for track driving to allow the driver exploit the Abarth 124 spider's outstanding balance and dynamic abilities to the full. The three-point seat belts employ Constant-Force Retractors (CFR) to control the degree of force applied by the belt and then gradually release it in controlled manner. The LED adaptive headlights are available to guarantee driving pleasure even in poor visibility conditions. They can be equipped with rain sensor and dusk sensor on demand. The following details apply to the EMEA region and may vary according to the various market needs. See the www.fiatpress.com website for complete information. 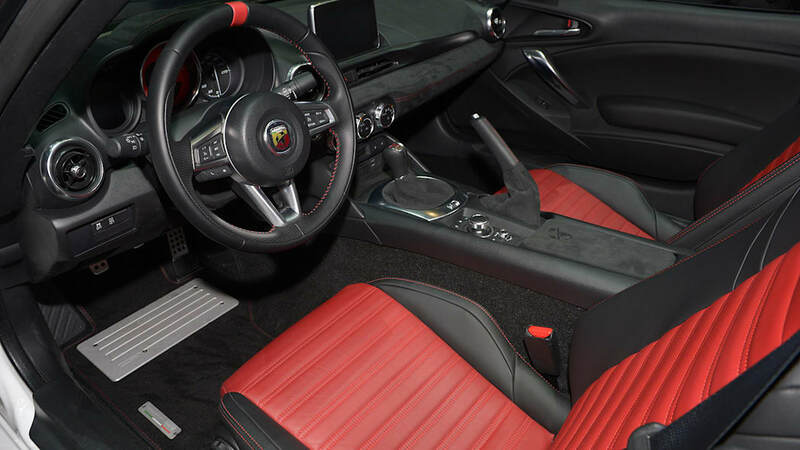 The new Abarth 124 spider has a three-gauge instrument panel featuring a large rev counter in the middle, a speedometer on the right and a data display on the left allowing the driver to monitor all key driving information at a glance. Standard equipment includes manual climate control system, stereo with four speakers, MP3 player and USB port, cruise control, adjustable and electrically-folded door mirrors. Other features available on demand include the infotainment system with an ergonomic and intuitive knob on the central unit. According to the configuration, the system can feature a 7-inch colour display, satellite navigation system, DAB digital tuner, two USB ports, AUX input, Bluetooth connectivity and a rear backup camera. For superior sound quality, a Bose premium sound system with nine speakers, including dual headrest speakers on both seats and a subwoofer, can be chosen. 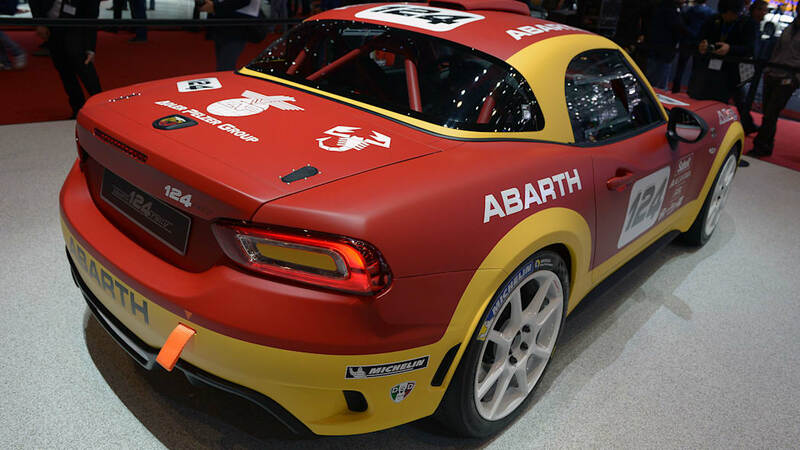 - The world première in Geneva for the prototype developed by the Abarth Racing Team. - Under the bonnet a powerful 1800 direct injection turbo engine delivering 300 HP. - Rear-wheel drive with self-locking differential for second to none performance. 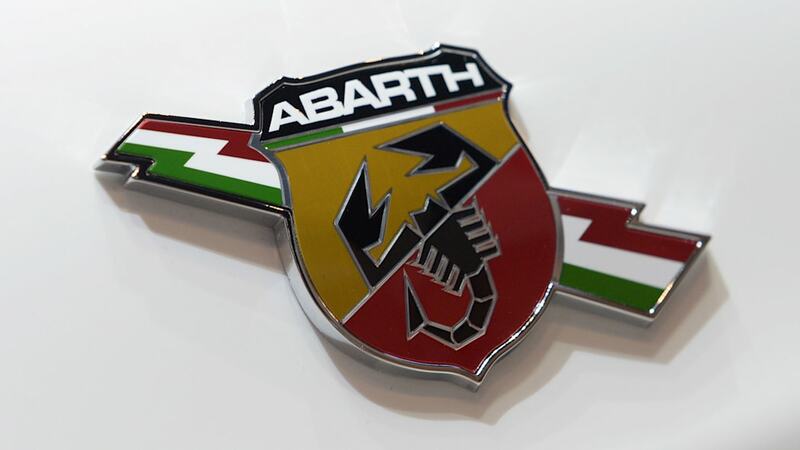 - Refined technical solutions to make the new Abarth protagonist of the rally. - Dedicated to all those who together with the brand share the racing world's values. "Left 4 cut, 30 caution jump, right 5 left 3 close, 100, right 2 don't cut..."
Along with the Abarth 124 spider, the first prototype of the 124 rally also has a surprise début. For the first time, the road car and the racing car have been developed and unveiled together. 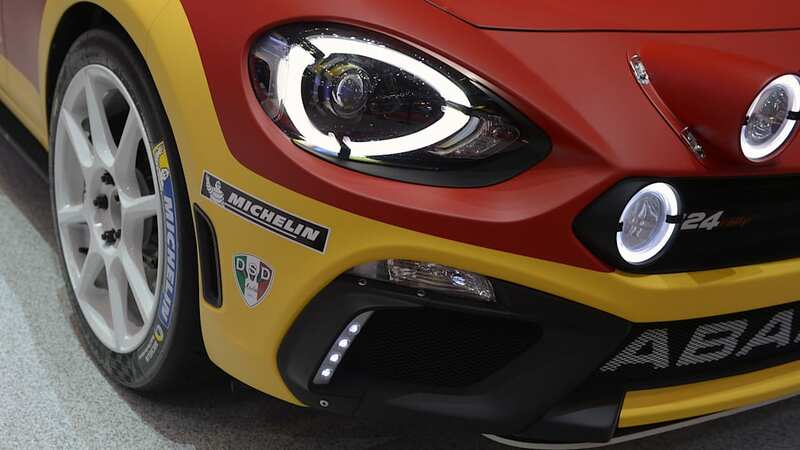 The new Abarth 124 rally is a combination of pure technology and performance born from the experience of the Abarth Racing Team to bring back the Scorpion to the most glorious and demanding rally tracks, from the sticky sunburnt tarmac to the more slippery ice surfaces. Forty years after its last official race, the 1976 Monte Carlo Rally, the Abarth 124 Rally is back with the same mission: to test road cars' technical solutions under extreme conditions and to guarantee all Abarth customers excellent performance and maximum reliability. It is dedicated to all those who share the brand's sense of challenge and racing world values. Under the bonnet, it fits the 1800 cm3 "bialbero" turbocharged direct injection engine. Thanks to the different selectable mappings, it provides power up to 300 HP at 6500 rpm and optimum torque curve, a key element to allow the driver steering and acceleration balance while oversteering. Performance is breath-taking; acceleration is scorching and marked with full, riveting sound. The project was developed to ensure reliability and performance, even in the extreme conditions typical of rallies: ice, dirt, dust, water, heat. Even the transmission was designed to enhance performance: the engine is coupled to a quick 6-speed sequential gearbox with shift paddles and traction is assured by the mechanical limited slip differential. Racing, for Abarth, is not only adrenaline, but also testing grounds to experiment with solutions that guarantee performance and excitement. To enhance the 124 rally's competitiveness, the Abarth Racing Team's engineers have worked with precise objectives: first of all, weight reduction and overall balance. For this reason, the engine is mounted behind the front axle; for the cockpit and the engine compartment, light, resistant materials were used, while the soft top was replaced by a fixed composite hard top. With these features, weight distribution leans slightly towards the rear axle, ensuring maximum traction even in low grip conditions. The centre of gravity was further lowered as compared to the road car to the advantage of road grip and straightforward performance. 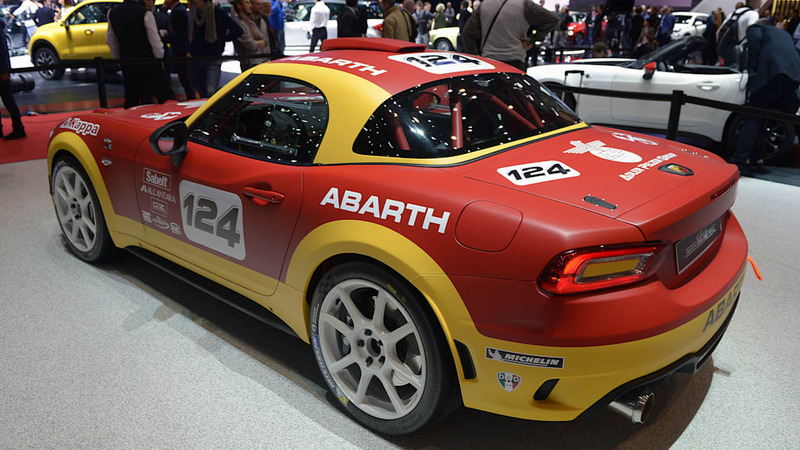 The new Abarth 124 spider was born light and agile, and the rally edition was further refined to star in competitions. Homologation in the FIA R-GT category has required structural reinforcements to guarantee even greater stress resistance and the highest safety standards for the crew, and the body now has a safety roll cage. The whole design has been engineered for maximum efficiency and ergonomics, to ensure driver and co-driver not only superior performance, but also attention to every minute detail, such as the arrangement of interior controls and available space in the cockpit. Rally cars undergo extreme stress; this is why the superb mechanical layout of the standard production car has been further developed: the high front-end double wishbone suspension and multi-link rear suspension have specific kinematic features with metal joints for maximum steering precision, ample control on corners, greater excursion for handling different road surfaces and adjustable dampers settings guarantee always superior grip in every situation. In conclusion the project code, SE139, has a great deal of history that goes back directly to Karl Abarth. The SE stands for "Sports" and "Esperimental", a direct link to the Abarth values of craftsmanship and Technical Upgrade. 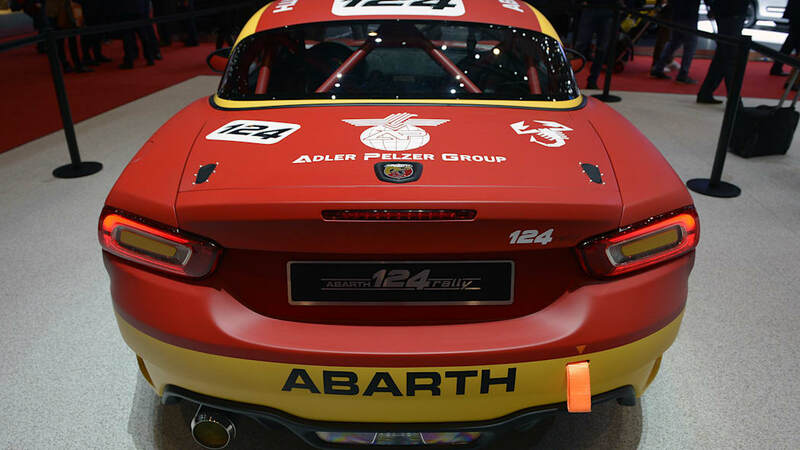 While the 139 progressive number exemplifies that in 67 years of history, Abarth has managed to develop an average of two racing projects per year. A great accomplishment that only a few other car manufactures can be proud of. Team Abarth has worked very hard to select best in class technical partners and sponsors. Among these, Petronas Selenia that has always been at the forefront in developing technologically advanced and high performance lubricants and it has contributed in the engine development. 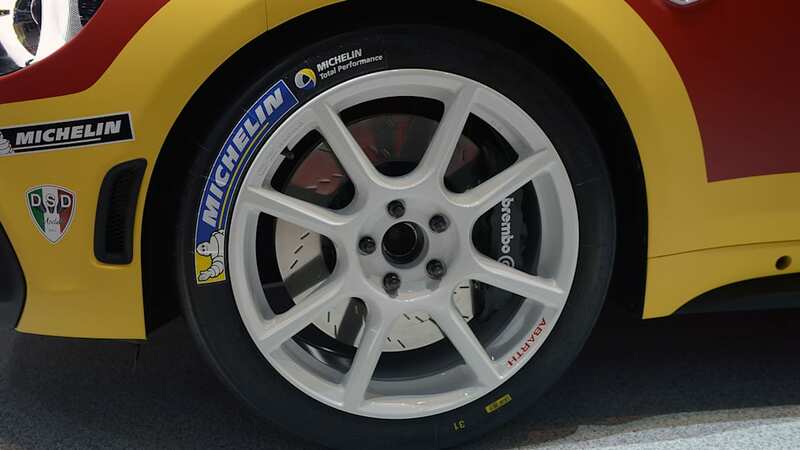 While Adler Pelzer Group was greatly involved in making crafting composite components for the car and Michelin is the technical partner for tires development. 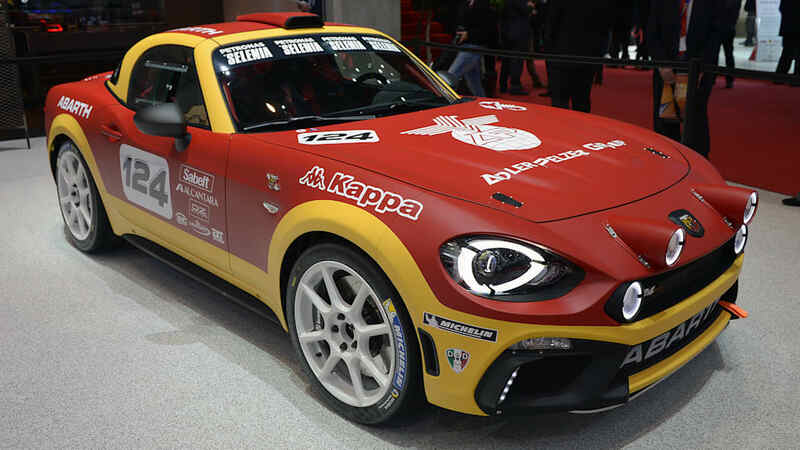 The Abarth 124 rally project is also a great showcase for a number of Italian companies which have been involved in racing for many years. 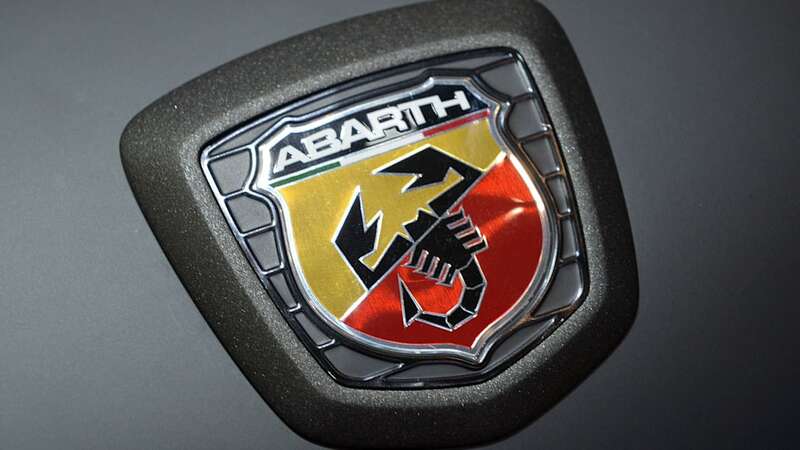 As is the case for Sabelt, one of the most well-known brand in motorsport, which contributes with its bucket-seats, seatbelts and other safety equipment, and also for Kappa, the leading sportswear brand worn by the entire "Abarth Squadra Corse". For what concerns the mechanics of the car, LM Gianetti, a company born some 40 years ago and witnessed the development of the first Abarth 124 Rally, has closely worked with Abarth's Technical Team to reengineer completely the bodywork and the suspensions scheme. Whilst, EXT SHOX has contributed with its specific know-how in the development of 4-way adjustable dampers used for the first time in a Rally car. BMC has supported the team in developing the air-intake system of the car, which it is crucial to allow constant and reliable engine performance. The lightweight, but at the same time robust racing wheels, have been developed and crafted by OZ, the legend in motorsport. In conclusion, as for the road-going model, Alcantara® has completely revamped the interior of the car starting from the dashboard to the seats trimming, with 100% "Made in Italy" technology contributing to saving weight and reduce sun reflections towards the interior of the car, allowing no interferences for the driver enhancing the driver grip on the steering wheel. 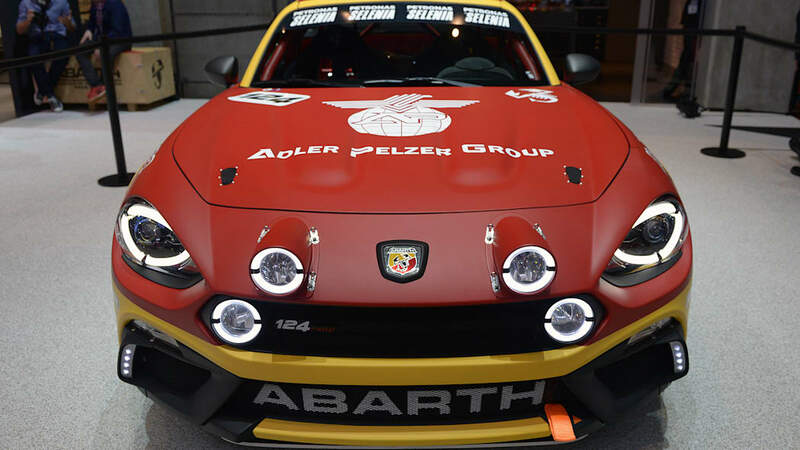 The team has worked with great passion to revamp a rally icon as the Abarth 124 rally, a rear wheel drive transmission is synonym of great fun for the drivers, but also for the public. Surely, people will queue up to see pass by the new 124 Abarth rally and see it powerslide, which have become very rare today. 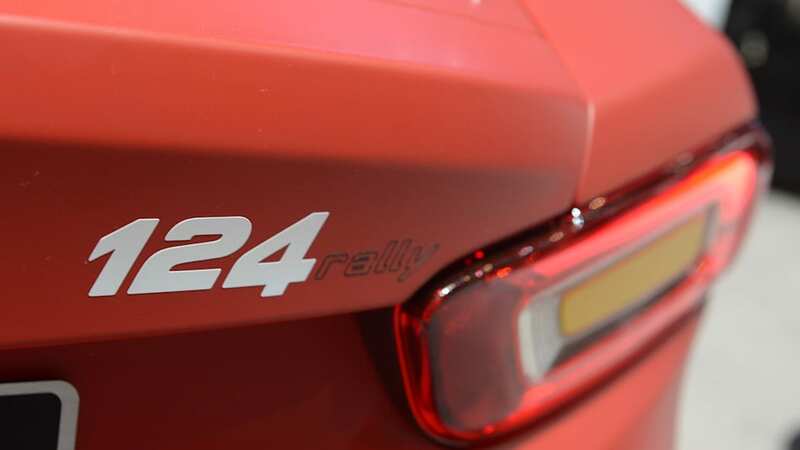 The new 124 rally developed with the best of technology available today, contributes to bring back sweet memories from the past of rallying in the 70's were competitions were more engaging and gathering massive crowds. After the Geneva MotorShow unveiling, Abarth opens the pre-booking phase to prepare your début in the 2017 rally season.